The Promax Store 90L is a regular gas boiler by Potterton. This boiler is a highly efficient condensing wall mounted model with a wide range of features to give it maximum reliability. This unit has an efficiency rating of 89% making it a B rated boiler. 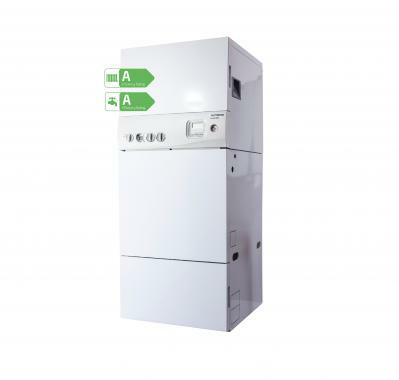 It also comes with an output rating of 24kW so you can be sure that you have bought a reliable boiler. With this model featuring a unique roller system, as well as a low lift weight boiler, it helps to save money on the installation of the unit! Other features include a simple mounting plate, a no pump overrun and pre plumbing jig. This unit is able to provide a simple and easy heating solution for homes with a high hot water demand. This model also provides a dependable and efficient solution for a new build and social housing. It is extremely compact in size making it able to fit in a standard airing cupboard easily. It is compatible with the Megaflo Eco Solar Cylinder and Santon Premier Plus Solar Cylinders so you are able to make the boiler even more dependable than it already is! this unit is also available in 90, 115 or 150 litre stores and comes with 2 years warranty to give you peace of mind!